Reduced physical activity (PA) in patients with chronic obstructive pulmonary disease (COPD) is associated with increased morbidity and mortality (e.g. exacerbations) and eventually leads to disability, depression, and social and physical isolation. Measuring PA in this population is important to accurately characterize COPD and to help clinicians during a baseline evaluation and patient follow-up. Also, it may help increase adherence to PA programs. There are reliable objective and subjective methods available to measure PA. Recently, several new monitors have been developed that have improved accuracy of such measurements. Because these devices provide real-time feedback, they may help to improve participant self-motivation strategies and reinforce daily lifestyle modifications, one of the main goals in COPD management. This review focuses on describing available instruments to measure PA, specifically in patients with COPD. The reliability, validity, advantages, limitations, and clinical applications of questionnaires, pedometers, and accelerometers are discussed. Finally, based on current published literature, we propose recommendations about which methods may be most useful in different research or clinical settings. The detrimental consequences of the sedentary lifestyle in patients with COPD have substantially increased interest in physical activity (PA) monitoring research in the past decade. The World Health Organization (WHO) defines PA as "any bodily movement produced by skeletal muscles that require energy expenditure." Progressive dyspnea in patients with COPD causes a spiral of deconditioning due to persistent inactivity and, therefore, to even more activity limitation.1-6 Reduced PA levels in COPD has been associated with increased morbidity and mortality as well as sustained disability, depression, and social and physical isolation.7-9 Depression, a common comorbid condition in COPD, may also negatively contribute to physical inactivity and difficult lifestyle changes in these patients. Current COPD treatment guidelines strongly recommend pulmonary rehabilitation (PR) programs, with exercise being an essential component in PR.10 Although the intent is to increase PA after the PR program, the translation to daily PA is questioned as it is not routinely measured.10,11 Because of the inherent difficulties for patients to maintain regular PA and the learned lifestyle changes over time after pulmonary rehabilitation, several tools have been developed to quantify PA in patients with limited exercise capacity, such as with COPD patients. Compared to their use in normal or high functioning individuals (e.g. athletes), use of activity monitors can be less accurate in many patients with moderate to severe COPD, whose walking speeds can be as low as 0.5 miles per hour. Due to the advances in technology, new PA devices may be able to provide sufficiently accurate measurements in such patients. However, this field is quite new, and some of these devices are still being evaluated in this particular group of patients. It is important to recognize that because of the live feedback provided by PA monitors, their use may be very appropriate in a clinical setting as they can encourage patients to maintain higher levels of exercise and ultimately lead to the intended positive behavior changes. This review will focus on available instruments to measure PA in patients with chronic lung disease, specifically COPD. The reliability and validity of each method and potential clinical applications will also be discussed. Measuring PA accurately in such patients may help to improve patient behavior, mood, daily activity level, and health-related quality of life and, potentially, help reduce exacerbations and dyspnea. We used PubMed and Web of Science engine platforms for a literature search in April 2014. The key words used were COPD and physical activity with the terms, questionnaire, pedometer, accelerometer, activity monitoring, and activities of daily life. We then reviewed the references identified in order to refine our search. Each article was inspected manually. We limited selection to those studies that: (1) included COPD patients as the study population, (2) were in adults, and (3) measured PA levels. Additional tools that assess functional status, self-efficacy, health-related quality-of-life, and functional exercise capacity are beyond the scope of this review and were, therefore, excluded. Test-retest reliability refers to the degree that an instrument produces consistent results when administrated multiple times in the same individuals. Although some studies evaluated the reliability of questionnaires used to quantify PA in healthy individuals, none were specific to patients with COPD.2 Criterion validity refers to the degree that an instrument can predict the test result measured by an objective reference method. 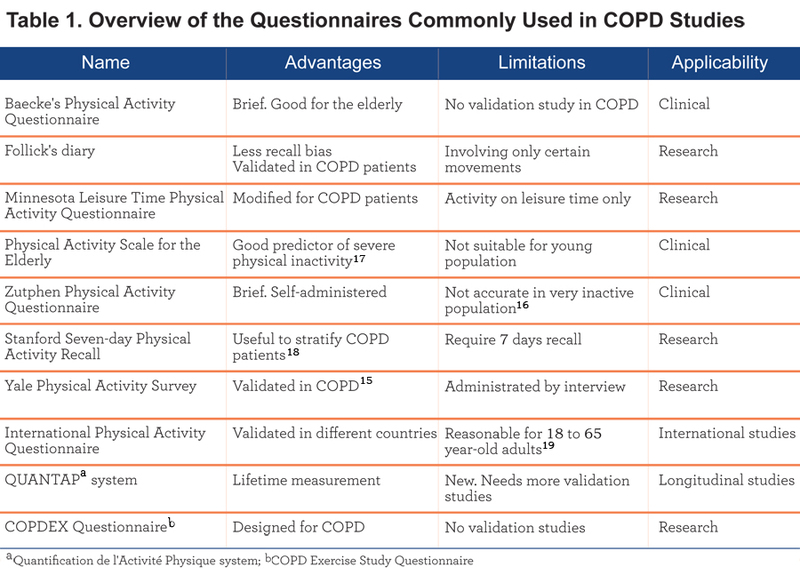 Many validation studies of PA questionnaires were performed in the elderly or general population and not in COPD.13,14 Because of the common inactivity and low exercise capacity associated with COPD, caution is warranted in applying these instruments to this population. The COPD Exercise Study Questionnaire (COPDEX Questionnaire) asks participants about their exercise routine and other daily activities to assess the PA level.23 The results of the Exercise Study showed that when the severity of disease progressed the individuals became less active. However, we are not aware of any published validation study of the COPDEX Questionnaire. Accelerometers are more advanced technically and more expensive than pedometers. Therefore, price may be an important factor affecting which device to use for research or clinical needs. Vertical motion assessment by an accelerometer can be considered equivalent to a pedometer. Accelerometers can be worn on the wrist, waist, or ankle. They typically measure and store the quantity and intensity of movements over a period of time. A mathematical algorithm converts the intensity, frequency and duration of bodily motion into a numerical value called vector magnitude unit (VMU), the vectorial sum of movements (activity counts) in 3 orthogonal directions. The output is an estimate of energy expenditure (EE). A variety of pedometer models have been marketed. Some major producers include Omron (Lake Forest, Illinois), Yamax Digi-Walker (Tokyo, Japan), Accusplit (Livermore, CA), FreeStyle (Long Island, NY), New-Lifestyles (Lees Summit, MO), Oregon Scientific (Cannon Beach, OR), Sportline (Yonkers, NY), and Walk4Life (Plainfields, IL). An overview of the motion detectors commonly used is provided in Table 2. Test-retest reliability of pedometers is generally high (e.g., intraclass correlation coefficient of 0.94); however, variations between devices of the same model have been noted, so they should be used with caution.25 One study found that results from pedometers were highly correlated with triaxial accelerometers;26 however, they tend to have lower accuracy and generally underestimate activity in individuals with very slow walking or inactivity, a hallmark of COPD patients.27 A validation study of the DigiWalker SW701 device found that it was accurate for step counting and EE estimation in COPD patients at faster walking speeds, but significantly underestimated activity at slower speeds.28 Another study in 36 COPD patients assessed the criterion validity of the DigiWalker SW701 against indirect calorimetry and reported significant underestimation in the sum and for each of 5 activities (walking on the level, walking on the level carrying a backpack, walking up/downstairs, rising/sitting in chairs and moving objects in and out of a shelf).29 One study of the accuracy of the Omron HJ720ITC in 51 COPD patients found that the pedometer was accurate at a regular walking speed >0.94 m/s but had higher variability at lower levels of exercise. A new triaxial accelerometer, Actimarker (Panasonic, Osaka, Japan), is a lightweight (36g) and small (74.5 × 13.4 × 34.0 mm) device worn at the waist that can continuously monitor PA for more than 1 month. A validation study demonstrated that Actimarker measurement was highly correlated with DynaPort and confirmed its reliability.41 Compared to DynaPort, Actimarker is more compact, lightweight, and has a longer lasting battery. Another newly developed pedometer, Fitbit (Fitbit Inc, San Francisco, CA), was evaluated in healthy adults, elderly, and persons with stroke and traumatic brain injury.42 A validation study of Fitbit by Takacs et al demonstrated that it provided valid measurements in healthy young adults.42 On the other hand, another study found that Fitbit significantly underestimated EE.43 More highly functioning, ambulatory patients, such as those with stroke or traumatic brain injury, may be particularly suited for using Fitbit.44 Similar results were found by Lauritizen et al in elderly individuals with normal mobility or otherwise healthy adults.45 Although this device hasn’t been evaluated in the COPD population, it may play a role for individuals with higher exercise capacity because of its simplicity of use and low cost. In patients with COPD, the activity monitor devices can be important instruments to measure baseline exercise capacity and stability or progression over the course of the disease. They can also help with maintaining behavior changes because of the inherent live feedback. Current PA research in COPD patients has focused on 4 major topics: 1) how PA predicts functional status and quality of life in COPD patients; 2) how interventions such as PR, home exercising programs, or new available drugs improve PA;46-50 3) characterization of PA in patients with associated comorbidities (e.g. anxiety, exacerbations);46,49 and 4) the validity and reliability of the PA devices. Self-report methods are inexpensive and relatively easy to administer but are less accurate than objective methods and are recommended for epidemiological studies or when direct activity monitoring is not feasible. Their reliability is typically good to excellent while their criterion validity is generally poor to moderate.51-53 These are flexible methods that can be administered by mail, web-based platforms, in-person visits, or via telephone. The major disadvantage is recall bias and an overestimation of PA levels, especially in low functioning individuals,3,12 and in those with cognitive impairment.54 In selecting a questionnaire for patients with COPD, we need to consider the type of measurement needed (e.g., categories [low, moderate, high] vs. continuous score). 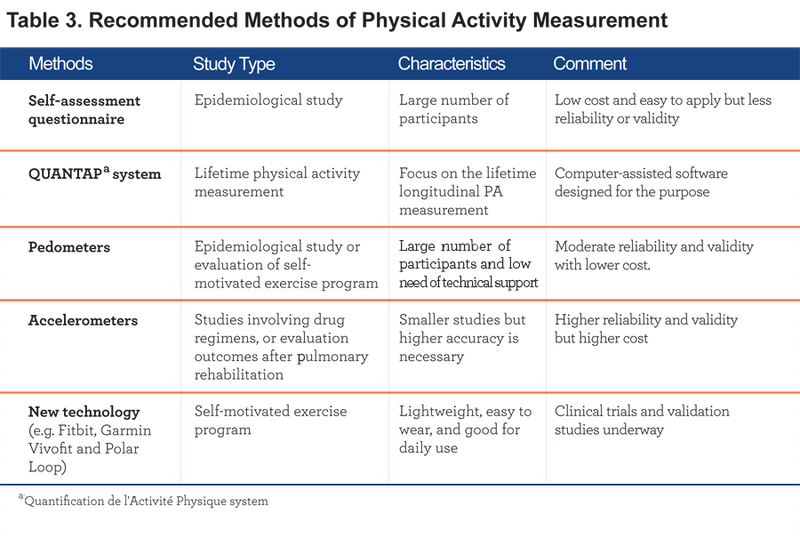 For example, the Baecke Physical Activity Questionnaire and the PASE estimate the PA level as a continuous measure while the IPAQ estimates the PA level as either continuous or in categories. If we need to evaluate a lifetime PA, the QUANTAP would be a reasonable choice. Pedometers are simple to use, relatively inexpensive, and convenient with acceptable validity and reliability. However, they lack information about the pattern, time, and intensity of PA and compared to accelerometers, can only detect vertical movements and are not sensitive to more subtle movements seen at low walking speeds. Accelerometers (especially multiaxial) can provide more detailed information but at a higher cost. In patients with low levels of activity such as those with COPD, advanced pulmonary fibrosis, pulmonary hypertension, or other severe chronic lung disorders, we may need a more accurate and sensitive device due to the common limited exercise capacity. The field of activity monitoring with accelerometers is frantically advancing and now more affordable monitors are being produced and may represent the future of the field. The duration of testing required for meaningful data is at least 4 days.55 There is not much difference between pedometers and accelerometers regarding wear time or position. Usually, current recommendations for pedometers are to obtain measurements over 1 week to help reduce variation between weekday and weekends.56-58 For accelerometers, it is generally recommended to obtain between 4 and 12 measurement days for more accurate data.58-61 Some authors have suggested 2 weeks of data collection, although to our knowledge this has not been demonstrated to be necessary. Future PA monitoring studies should include the new and simple technology (Fitbit, Garmin Vivofit and Polar Loop). In addition, studies need to be able to properly evaluate upper body activity motion, which is an important component in COPD for activities of daily living. To date, studies have been mainly focused on whole body physical activities (using questionnaires or accelerometers) or lower body activities (using pedometer for step counts) because of the difficulty in assessing upper body motion. Therefore, we cannot assess the independent effect of upper body activities in such patients. Upper body exercise training has been included in PR specific to COPD patients.63-65 In addition, upper body exercise can be especially useful in wheelchair bound patients and in the elderly with high fall risks. Furthermore, PA monitoring in patients with COPD is useful for both clinical and research purposes. In research as a tool to evaluate interventions such as PR, home exercising programs, or the effects of new drugs under development. In a clinical setting, activity monitoring may be important to help guide self-motivation strategies, evaluate mid to long outcomes, and provide live feedback that leads to desired patient behavior modification, which can be monitored using telemedicine resources and therefore have a true live patient-to-health provider interaction. 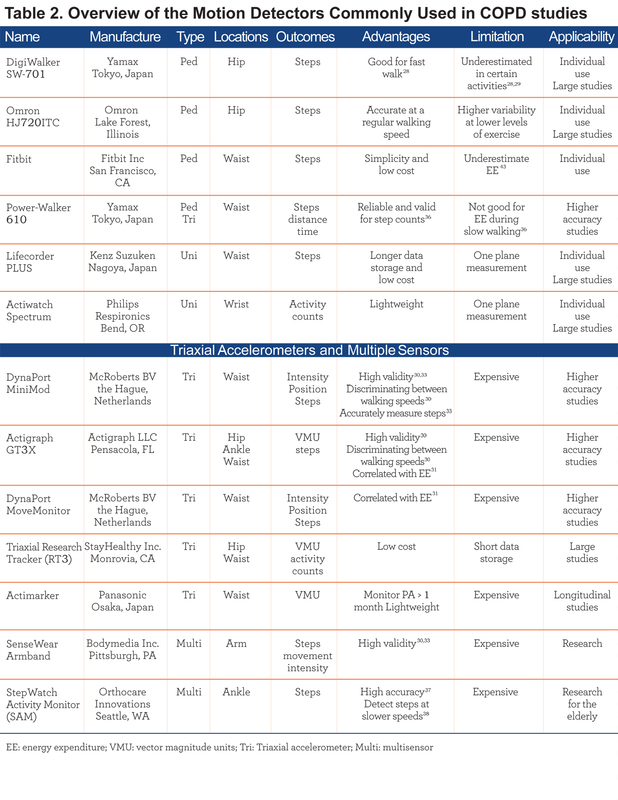 While many options are available to assess PA, the decision about which method to use for a particular purpose requires consideration of several factors, including: 1) the specific research question,2) the population,3) availability of a specific device, 4) principal investigator and staff training, and: 5) available budget (Table 3). In general, self-assessment questionnaires are appropriate for large epidemiological studies because of the associated low cost and ease of administration. For smaller studies that require higher accuracy (e.g. drug-related studies or COPD outcomes after a pulmonary rehabilitation program), accelerometers, and particularly the new technology offered, need to be further investigated and may be preferred. Pedometers can be used for individual self-assessment and biofeedback, and can provide personalized physical activity profiles to help behavior modification. The new generations of devices to assess PA incorporate complementary technology like inter-phases with tablets and telephones and can be a significant reinforcement for behavior change as the patient is given direct feedback. There is a need for judgment of what device is appropriate in a case-by-case fashion, as elderly individuals may prefer simpler devices. Furthermore, the addition of physiologic measures (e.g. heart rate, pulse oximetry) or global positioning system- GPS capabilities may improve the characterization of daily activities in patients with COPD and help to tailor intervention strategies particularly in PR where improving daily physical activity is a much desired but not yet attained outcome. 9. Gimeno-Santos E, Frei A, Steurer-Stey C, et al. Determinants and outcomes of physical activity in patients with COPD: a systematic review. Thorax. 2014. Published online first February 20, 2014. 16. van Gestel AJ, Clarenbach CF, Stowhas AC, et al. Predicting daily physical activity in patients with chronic obstructive pulmonary disease. PLoS One. 2012;7(11):e48081. 21. Vuillemin A, Guillemin F, Denis G, Huot J, Jeandel C. A computer-assisted assessment of lifetime physical activity: reliability and validity of the QUANTAP software. Rev Epidemiol Sante Publique. 2000;48(2):157-167. 22. Gouzi F, Prefaut C, Abdellaoui A, et al. Evidence of an early physical activity reduction in chronic obstructive pulmonary disease patients. Arch Phys Med Rehabil. 2011;92(10):1611-1617 e1612. 27. Steele BG, Belza B, Cain K, Warm C, Coppersmith J, Howard J. Bodies in motion: monitoring daily activity and exercise with motion sensors in people with chronic pulmonary disease. J Rehabil Res Dev. 2003;40(5 Suppl 2):45-58. 35. Andersson M, Janson C, Emtner M. Accuracy of three activity monitors in patients with chronic obstructive pulmonary disease: A comparison with video recordings. COPD. 2014.e-Pub ahead of print April 15, 2014. 45. Lauritzen J, Munoz A, Luis Sevillano J, Civit A. The usefulness of activity trackers in elderly with reduced mobility: a case study. Stud Health Technol. 2013;192:759-762. 47. Hataji O, Naito M, Ito K, Watanabe F, Gabazza EC, Taguchi O. Indacaterol improves daily physical activity in patients with chronic obstructive pulmonary disease. Int J Chron Obstruct Pulmon Dis. 2013;8:1-5. 55. Berlin JE, Storti KL, Brach JS. Using activity monitors to measure physical activity in free-living conditions. Phys Ther. 2006;86(8):1137-1145. 62. Dallas MI, McCusker C, Haggerty MC, Rochester CL, ZuWallack R and Northeast Pulmonary Consortium. Using pedometers to monitor walking activity in outcome assessment for pulmonary rehabilitation. Chron Respir Dis. 2009;6(4):217-224. 63. Ries AL. The importance of exercise in pulmonary rehabilitation. Clin Chest Med 1994;15(2):327-337.